Jason: Right now we'll talk about how to dribble the basketball faster. And handling the ball with speed is good because it makes it more difficult for the defender to steal the ball from you. 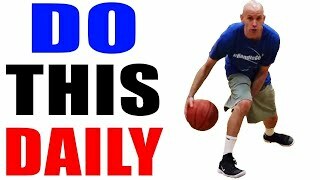 So right now we'll walk through a couple of quick drills that we use on a regular basis that help us to handle the ball faster. First ting we want to do is work on a particular drill and then you want to try to go for speed in it. Right now we have one of our coaches, Jerry, who's gonna time us on these particular drills. Right now Sammy will go for 15 seconds and what'll we'll do right now is he's gonna do his first set for 15 seconds and then we'll have him do a second set to see if he can increase his speed as far ball handling. So right now, Sammy will get nice and low. He's gonna cross over and go behind his back. Every time the ball gets to his right hand, he's gonna count the rep. So I'll count for him right now. Jerry when you tell me to go, we'll go. Jason: One, two, three, four, five, six, seven, eight. Alright. So Sammy did eight in 15 seconds. So now he has a goal where every time he works out he has a point of emphasis in the base as far as trying to exceed his time. Now I'll try to do something a little bit more advanced with the advanced ball handlers. And remember, everything that we do I'm gonna try to do with my eyes closed and head up. Jerry'll give me 30 seconds on this. Jason: One, two, three, four, five, I lose it, I come right back. Eyes closed, chin up. Six. Jason: Alright? So I got to about six and a half. So right now we'll have Sammy finish up to see if he can do it any faster than he did his first set. So again Sammy will have his eyes closed, chin up. He'll get low. Eight is his number to beat. 15 seconds. Jason: One, two, three, four, five, six, seven, eight, nine, ten. Jason: Alright. So you see? Now, Sammy worked on his ball handling. He was able to get ten. 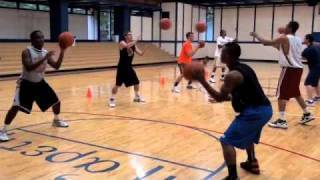 Those are the types of drills that you can do on a regular basis in order to be come a faster ball handler. 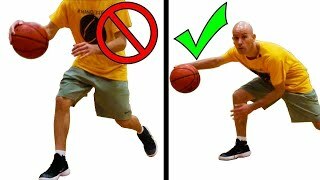 How to: Dribble Against Fast Defenders! Never Lose the Ball Again! !